Warhammer Tau: The Greater Goodzilla! Let's talk about competitive Tau. This has been on my mind lately as my group has a tournament coming up next weekend. I am not a regular tournament player, and I have yet to make it out to any of the 'major' tournaments, but I'd like to think that I stay on top of what is good and what is not via the interwebs. Tyranids have long been the MC faction, since they didn't have access to vehicles. Over time Daemons may have challenged that title, As the editions rolled by it became apparent that MC's were better than vehicles, so instead of fixing the MC/Vehicle power level, GW instead chose to give other factions MC's as well. Then superheavies and gargantuans came. So who is better at fielding tons of MC's/GC's? Tyranids are always a contender with their maximum Flyrant lists. Daemons can do the flying circus. But I think that Tau have claimed the title. For starters, we have access to lots of MC's and they are all good. 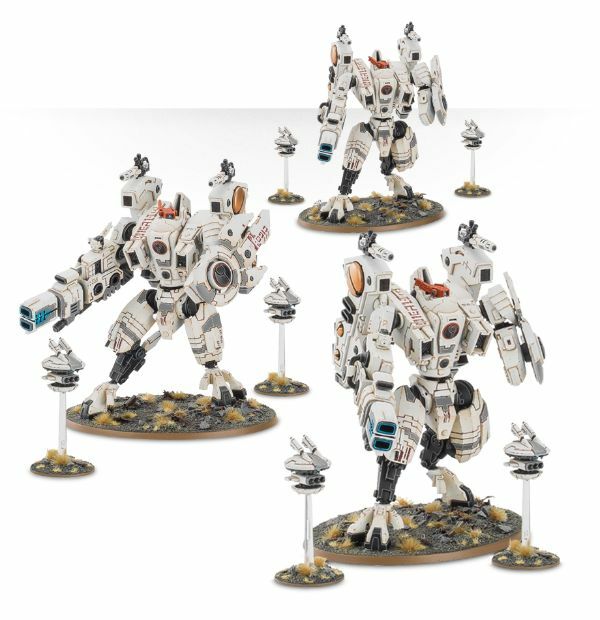 The Riptide has been a staple of competitive Tau lists since its release. Similarly, the Stormsurge has become almost a requirement for competitive play since D strength is important. You also have the Ghostkeel and, although he is a bad pick, the Coldstar Shas'O is an FMC. Tournament Tau has become dominated by MC's when it was already toeing the line with people bringing as many Riptides and/or Y'vahra as they could. The formations available made them too good to pass up, so now it is very rare to see a Tau list that isn't some form of the Greater Goodzilla. 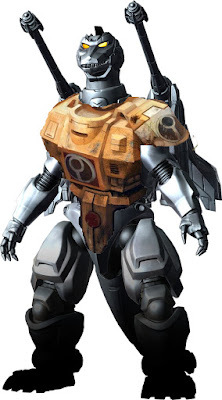 There are a couple ways that Tau can run MC heavy. Both of them hinge one of the strongest formations available to us: the Riptide Wing. Reliable Nova charges, BS boosts, and double the firepower for a turn? Yes please. It is also entirely composed of Riptides so there is no 'tax' on units you don't really want. Bare bones but very effective. This list abuses the inherent superiority of Gargantuan Creatures. The markerlights are a requirement when fielding the Stormsurge but otherwise it just pounds the enemy into submission with big suits. If the enemy runs a deathstar you can pump D-missiles into it and wear it down with the Hailfire attack. If they go MSU you have lots of flexibility with being able to shoot different targets. Anything that gets through this veritable wall of bullets has to tangle with the Stormsurges in close combat, which isn't a great prospect since you'll be hit with 2xD3 stomps if you can't kill them outright. This list's objective is to alpha-strike so hard the enemy has no chance of making up the difference. After you lose your markerlights and use the Hailstorm, the list is quite tame since everything is BS3 and likely nothing has D strength. You also can't ignore cover outside of the SMS. On the plus side, it is very fast-moving and can handle the objective game quite well once it thins out the enemy ranks in the first turn or two. Fill out the Stealth teams, Riptide team, or add a Drone Net for marker support. Less well known but pretty brutal. The Ghostkeels are extremely good in the OSC and were the go-to unit before the Riptide Wing was available. The kinds of things the Riptides struggle with (jinking transports, flyers, units in cover) are prime targets for the OSC and they can really bring the pain while being essentially immune to return fire. In this setup, you are also maximizing your Riptide Wing efficiency and the Fire Team rule. The 3-man unit will always have the networked reactors and +1 BS. 5-6 Riptides shooting twice is like having an extra 1000 points in your army for a turn too. Even without marker support, this list can usually stage its attacks to ensure almost everyone is shooting at BS4 or BS5. Instead of focusing on the Alpha Strike, this list wears you down and cripples you with continuous blows that hit harder than you'd originally thought they would. True, there aren't any D weapons, but the weapons it does have are shooting very accurately and probably ignoring cover as well. All with no marker support. It can also do this to multiple targets, while the Mont'ka list can only do that to a single target via markerlights. The objective game is a bit harder for this list, since its close combat presence isn't as good and it doesn't move quite as fast, but the Stealths provide some handy units for capping objectives that will be a pain to remove from cover. Unfortunately, I do not have the models to run either of these slices of cheddar. I own 2 Ghostkeels but I felt that I really needed 3 to make the OSC shine. I also only own 4 Riptide/Y'vahra/R'varna which wouldn't be enough to make the Riptide Wing shine either. So I went with the Mont'ka list and worked down from there. I have a Stormsurge, the Riptide Wing, the Commander w/ Marker Drones, and the 2 crisis suit teams (FSE) as my Troop Tax. Instead of the second Stormsurge (which I don't own) I included the Y'vahra and a Culexus Assassin. The Culexus is hopefully my ace in the hole in case someone tries to abuse Psychic shenanigans against me. The Y'vahra brings some novelty to the list in order to throw the veteran players. If I play these two right I should have a chance against just about any list. I have heard that Orks give the Mont'ka list trouble since there are too many bodies and they move too fast. In this case, I am going to have to resort to my (thus-far) successful tactics of baiting them into unfavorable places with my Y'vahra and Heatwaves. I think that the Stormsurge will also be a prime piece of bait so I'll have to deploy him accordingly to draw away the orky deathstars. It is pretty simple to take these extreme lists and then scale them back for your own use. 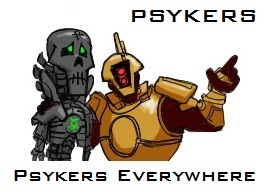 Unfortunately, I feel that there aren't that many competitive lists for Tau that deviate too far from these options. What do you think? Do you have an alternative build that is a tourney winner? Have you faced this type of thing before? The Culexus has done real work for me in the past. Even if you go second, and he is killed top of turn one, he forced a major decision on your opponent. They either had to avoid him (giving up position and slowing down the deathstar), or suffer a turn without all their blessings up and running. He's also great for "turning off" maledictions, particularly Paroxysm in Flyrant spam lists.